I thought it would be fun to share a short, simple tutorial on gold leaf now that my class has come and gone. The end result of using gold leaf on something creates a pretty gilded look – but leaf paper is one of the trickiest craft supplies to work with!! 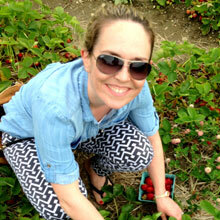 If you are interested in gold leafing, I would suggest taking a class and practicing a lot. Leaf paper is so delicate that it tares easily. It can hard to have it “do” exactly what you want it to do. The upside is that it’s easy to layer the leaf paper to get great coverage and as long as you’re not looking for a perfect, smooth look – you will be thrilled with your results. 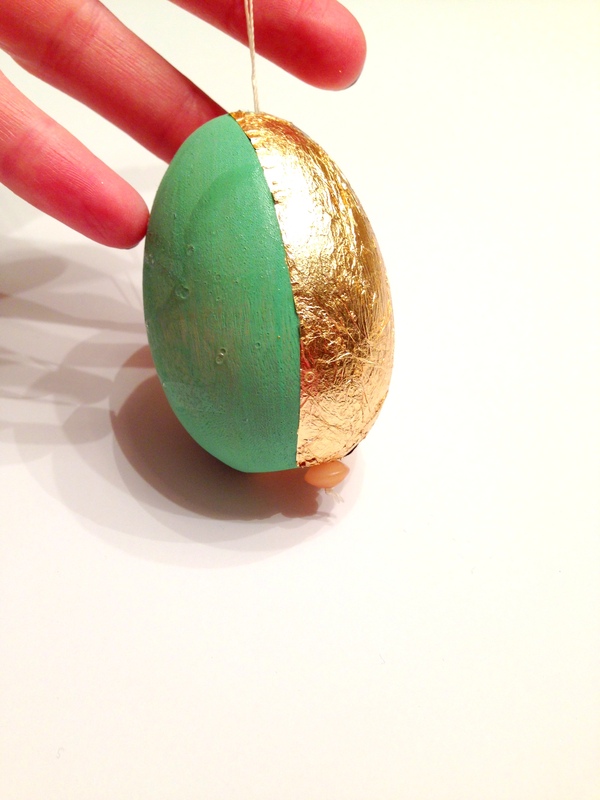 For a gold leaf project, you will need: Metal leaf spray sealer, gold leaf adhesive, a few paint brushes, metal leaf sheets (I used gold), and of course, the item you are going to add the leaf to – in this case it’s a wooden Easter Egg that has been painted a pretty spring green. Through the links above, you can see I ordered everything through Amazon (we are addicted to Prime) but Martha Stewart makes a fabulous line of leafing products sold at Michaels. When working with gold leaf, the first step is to prep your surface. If you’re using wood, it’s good to paint it first so it become less porous to absorb all of the adhesive. Next, paint on a thin layer of adhesive with one of the brushes. Let sit until it’s dried a little and slightly sticky. When working with wood as I am here, that’s pretty soon after it’s applied. Then stick on the leaf paper. Here’s where it can get frustrating. On something like this egg, you will never get a smooth surface of leaf with all the curves of the egg, so I applied it in pieces. 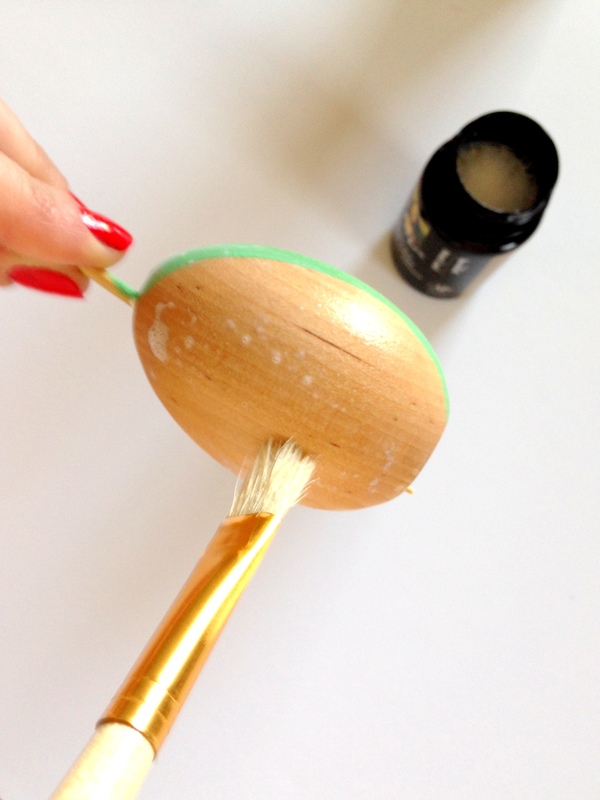 Your fingers will get a little sticky, so you can use another clean brush to help smooth the surface, but I much prefer to use my hands and just wash them off a few times throughout the process. Keep gluing, waiting, applying leaf until you have reached your desired coverage. 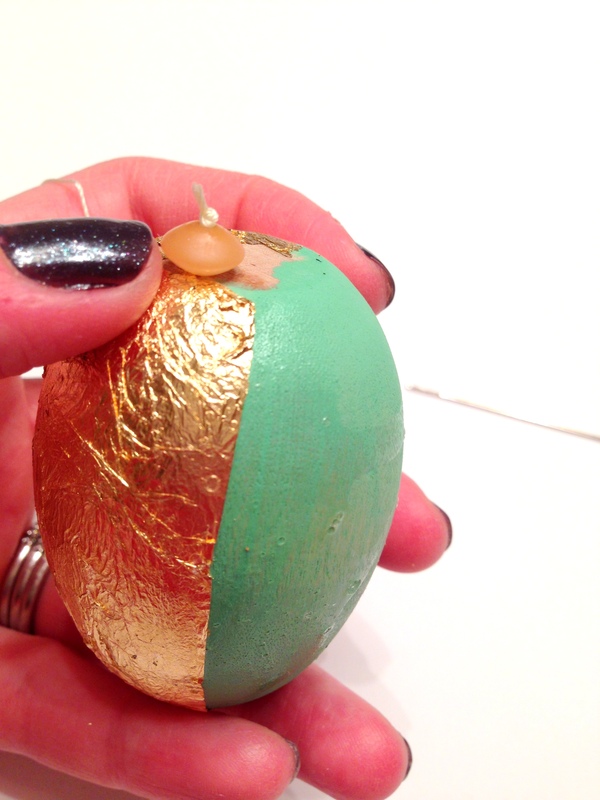 For this project, I hung the egg (as I did last year and the year before) so I threaded my egg after I was done leafing. 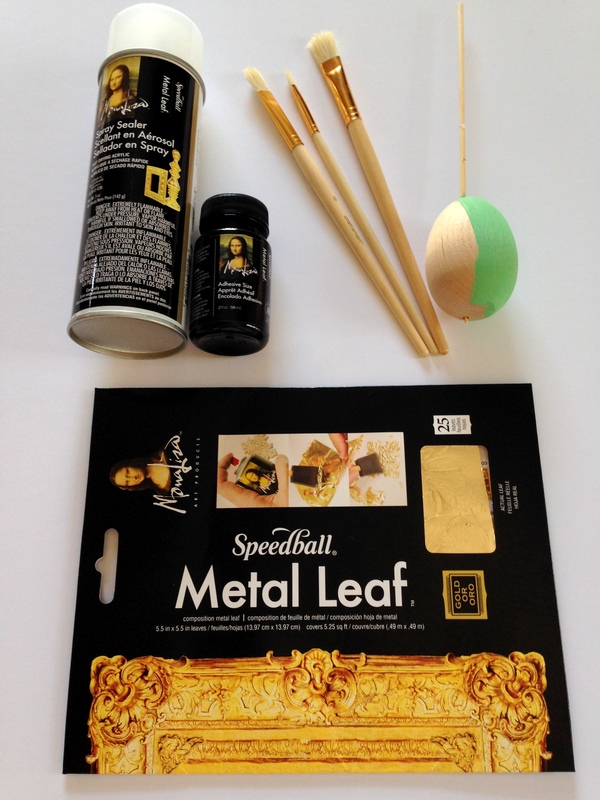 The final process in leafing is spraying your piece with the metal leaf spray adhesive to really seal the gold leaf so it won’t rip any further. Do this outside! You don’t want to be breathing this stuff! And voila! 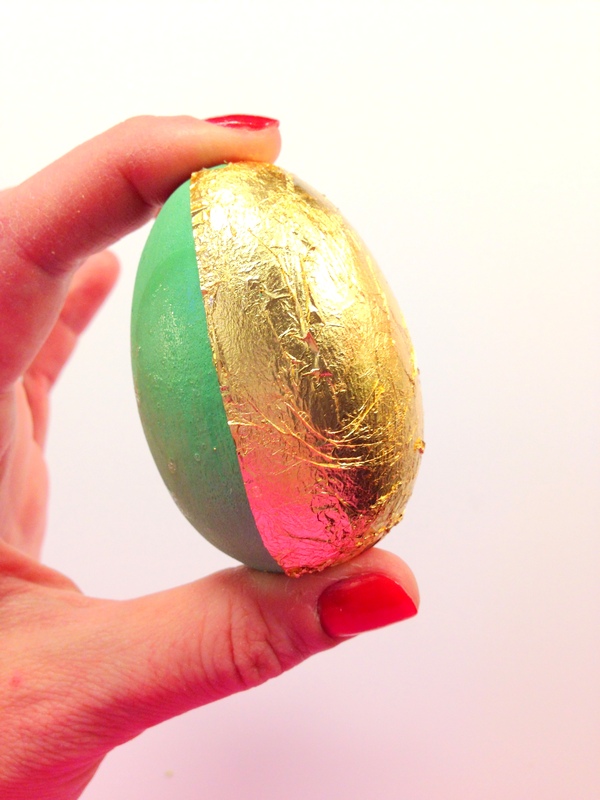 You have successfully used gold leaf to crafted a beautifully gilded item. More Easter crafts next week! 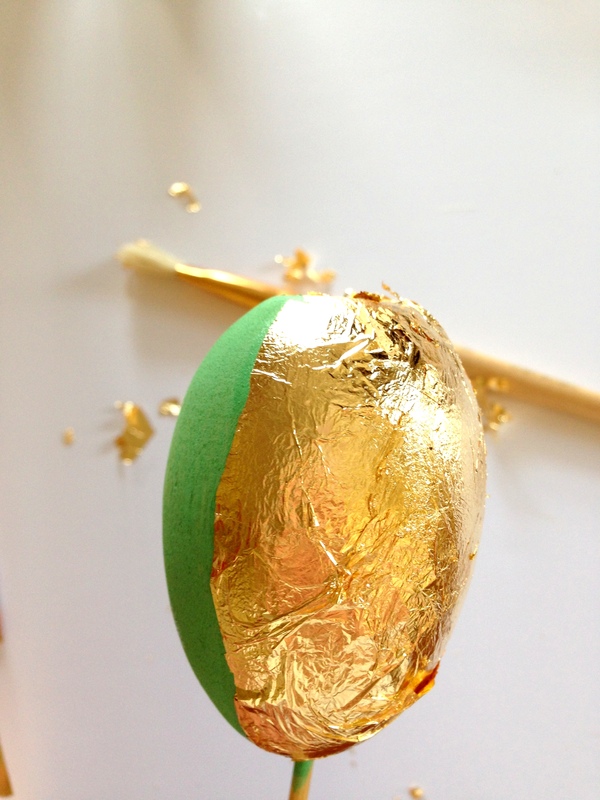 For being actually obsessed with adding gold to anything, I am ashamed that I have never tried working with gold leaf. These are too cute and I need to get up the courage to try crafting something like this!